Astronomers have found a plethora of planets around nearby stars. And it appears that Earth-sized planets in habitable zones are probably common. So, with tens or even hundreds of billions of potentially habitable planets within our galaxy, the question becomes: are we alone? Indeed, the search for alien life has become the holy grail for the next generation of telescopes and space missions to Mars and beyond. But could our search for E.T. be naively optimistic? Many scientists and commentators equate "more planets" with "more E.T.s". However, the violence and instability of the early formation and evolution of rocky planets suggests that most aliens will be extinct fossil microbes. Just as dead dinosaurs don't walk, talk or breathe, microbes that have been fossilised for billions of years are not easy to detect by the remote sampling of exoplanetary atmospheres. In research published in the journal Astrobiology, we argue that early extinction could be the cosmic default for life in the universe. This is because the earliest habitable conditions may be unstable. In our "Gaian Bottleneck" model, planets need to be inhabited in order to remain habitable. So even if the emergence of life is common, its persistence may be rare. Mars, Venus and Earth were more similar to each other in their first billion years than they are today. Even if only one of the planets saw the emergence of life, this era coincided with heavy bombardment from asteroids, which could have spread life between the planets. But about 1.5 billion years after formation, Venus started to experience runaway heating and Mars experienced runaway cooling. If Mars and Venus once harboured life, that life quickly went extinct. Even if wet rocky Earth-like planets are in the "Goldilocks Zone" of their host stars, it seems that runaway freezing or heating may be their default fate. Large impactors and huge variation in the amounts of water and greenhouse gases can induce positive feedbacks cycles that push planets away from habitable conditions. The carbonate-silicate weathering cycle, which provides the major negative feedback to stabilise Earth's climate today, was probably inoperative, or at least inefficient, until about 3 billion years ago. However, life on Earth may have had the fortuitous ability to create stability by suppressing the positive runaway feedback loops and enhancing the negative feedback loops. We should probably thank the unpredictable evolution of microbial communities our planet hosted early in its history for saving us from runaway conditions that would make Earth too hot or too cold for us to live. As soon as life became widespread on Earth, the earliest metabolisms began to modulate the greenhouse gas composition of the atmosphere. It is no coincidence that methane, carbon dioxide, hydrogen and water are all potent greenhouse gases and also the reactants and products of metabolic reactions of the earliest microbial mats and biofilms. The emergence of life's ability to regulate initially non-biological feedback mechanisms (what we call "Gaian regulation") could be the most significant factor responsible for life's persistence on Earth. The Earth is not the only planet in our galaxy with liquid water on its surface and energy sources and nutrients to enable life to form. Although the universe is filled with stars and planets conducive to life, the absence of any evidence for alien life suggests that even if the emergence of life is easy, its persistence may be difficult. Our work challenges conventional views that physics-based habitable zones provide stable conditions for life for many billions of years. Although, the cottage industry of habitable zone modellers can turn various knobs that control atmospheric and geophysical properties to stabilise planets over short-timescales, they have mostly ignored the role of biology in keeping planets habitable over billions of years. This is in part because the complexities of interactions between microbial communities that keep ecosystems stable are not sufficiently understood. We hypothesise that even if life does emerge on a planet, it rarely evolves quickly enough to regulate greenhouse gases, and thereby keep surface temperatures compatible with liquid water and habitability. Maintaining life on an initially wet rocky planet in the habitable zone may be like trying to ride a wild bull. Most riders falls off. So inhabited planets may be rare in the universe, not because emergent life is rare, but because habitable environments are difficult to maintain during the first billion years. Our suggestion that the universe is filled with dead aliens might disappoint some, but the universe is under no obligation to prevent disappointment. We should not expect technological or spacefaring civilisations because there is no evidence that biological evolution converges to human-like intelligence. And subjective philosophical notions of life in the universe should not inform our estimates of the probability of life beyond Earth. Superficially, these ideas seem to undermine the motivation for SETI and the recently announced Breakthrough Listen project. Nevertheless, we support SETI because when we explore new regions of parameter space, we often find the unexpected. In his book Pale Blue Dot, Carl Sagan reminded us that "in our obscurity, in all this vastness, there is no hint that help will come from elsewhere to save us from ourselves". In the two decades since it was published, we've learnt that our cosmic backyard is littered with pale dots, probably in many colours of the rainbow. As we embark on the adventure of exploring our galactic neighbourhood with bigger and better telescopes, we may find only spooky planets haunted by long dead microbial E.T.s. What are the chances of life on another planet? While Most Life dies in ANY given situation, there will be a slim number of survivors, perhaps underground, as Archaea without cell walls are able to, taking nutrients directly from the stone about itself. There always tends to be a minimum and a maximum level of Something, either enough Oxygen, Chlorine or Flourine and a reactable fuel or other chemical energy sources, or perhaps photosynthesis, and still being animal. That would make it survivable in times when there would otherwise be no food. Yes, there IS a Goldilocks Zone, but Life has this funny habit of hitting it out of the ballpark as to where and under what surprisingly harsh conditions we have found it here, makes other places in this Solar System look very easy going by comparison. Others can mock me here, but I have watched JPL destroy what was clearly a fossil of a Crinoid (type of very early plant) imbedded in a coral like rock. The Pics are there in the JPL Info site for the Landers and Rovers, just takes looking. The Earth was blessed. Even an atheist can see that. (This has nothing to do with any particular religion. Simply bait for the godless). No, but the ones that didn't die learned to fly, and now outnumber humans by a significant factor. Yep it's called the anthropic principle. It is unremarkable that Earth is special, because if it wasn't, we wouldn't be here. The Earth is special, life has managed to survive for billions of years. That doesn't mean that it's unique or done by a god. Life is here because it can be. If life on earth was impossible then we wouldn't be here. It's really that simple. I agree with the article. I believe microbial life is extremely common but intelligent technological civilizations are rare but we are not the only one. SETI is largely useless because the inverse square law makes it impossible for us to find radio transmissions. We need better telescopes that can see exoplanets and read their atmospheres for anomalies. This galaxy is 13 billion years old, and its 2nd generation (metal-rich) stars about 8 billion years old at most - our Sol is 4 billion years old. That is a vast amount of time for life to have arisen elsewhere, and we surmise that there are billions of potential elsewheres in this galaxy alone. So where are they? (as Fermi remarked). Unless their development is close enough on the timeline to ours, we expect them to be invisible to us. The probability of such a coincidence is vanishingly small. So if primitive, they have no effect on their ecosphere and are certainly not roving the galaxy. If advanced, they easily move about undetectably as far as we are concerned. There is no paradox. Maybe civilizations are widespread, but they too often have leaders who foolishly put too many other interests above their space programs, like fixing potholes, because they lack the mental faculties to perceive the tremendous long-term opportunities in space and the huge risk of stagnating on one world in a violent universe. These civilizations are eventually destroyed or fade away on pathetic, polluted worlds slowly shifting out of their stars' habitable zones. If we are one of the smart ones to avoid this fate, we can have a lot of fun playing archaeologist on these dead worlds and putting a fine point on just how pathetic these dead races were when the answers were right in front of them all the time. Maybe their science was robust enough to tell them about the trillion planets in the Milky Way, but their little brains could not envision it possible to ever reach them, so they gave up and forgot the lesson of exploration. Claiming it is "likely" for alien to die young is very premature when there is no evidence that it exists. Perhaps our cosy 'HZ Planet' *is* vanishingly rare due to the factors listed in the article ? Plus our unusually large Moon to constrain axial tilt wobbles and *mildly* stir the pot ? Perhaps mega-moons of Neptunians and sub-Jovians, with their tidal-powered heat source, is *the* environment to find life ? I find a certain irony with the exo-planet research that places our planet as a rarity (an ever increasing rarity as more and more research is done). Before modern astronomy, earth was viewed as the literal center of the universe. As we expanded our knowledge it was found that we orbited a mundane star in a mundane galaxy and was an infinitesimal blot in the universe. 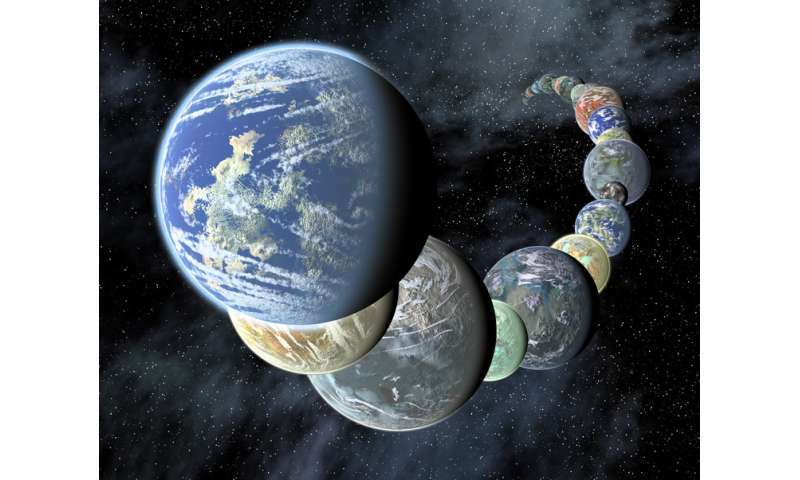 Given that trend it was assumed that trillions upon trillions of earthlike planets must exist out there. Now we are finding out that our earth might be one of the rarest items in this universe. Of course this doesn't sit well with the nihilists our culture produces in abundance. Has anybody ever thought that the fact that the moon and the sun's distance and size fit perfectly over each other during eclipses and maybe this is the perfect spark for life that stretches further than just the Goldilocks zone? Life on Earth has weathered many mass extinction events, showing that it is robustness and not fragility that life evolves towards despite the environment. And Gaia hypotheses as such, including albedo, has never become popular. They die when they face data. @Helo, Andrew: To extend on Fermi's Question, his "remark", he also answered it with [shorted] interstellar travel hasn't been shown to be possible. There is no "paradox" here, not even in Hart-Tipler's more popular argument. @darrell: The short time to life emergence show that it is highly likely (easy) elsewhere. @typicalguy: Selection bias is not really applicable here, see my comment on the extinction record, which shows it was not even close at any time. @SW: Not realistic, and not published in peer review. @OA, tblakely: Religion isn't applicable on science. It is true that our cultures still produce nihilists. But that is because religion was developed to be an opiate, as Marx remarked: "Religion is the sigh of the oppressed creature, the heart of a heartless world, and the soul of soulless conditions. It is the opium of the people".Religiosity correlates with social dysfunctionality, and religion does nothing but aligns people to that. But it isn't the religious's fault that they are such nihilists when it comes to humans and their suffering. Religion lack Enlightenment and science values, and has little to commend itself on moral values as Marx noted, hosting "arguably the most unpleasant character in all fiction" as Dawkins notes. If it is any comfort, religion is rapidly dying as poverty decreases from 80/20 in medieval societies towards zero globally. regardless of the weird religious posts above. The Earth is more unique than just being a rock in the goldilocks zone. Very little speculation has been done on composition combinations. There are over one hundred elements in the periodic table. They exist in the universe at a specific ratio. Within each planet that forms there will be different ratios of different elements to create a planet. Many combinations will not be conducive to life as we know it. The question becomes not how many planets of the right size in the right orbit, but, how many planets of the right size and right composition in the right orbit. Coupled with what early bombardment patterns may occur and how many of these would be lethal. What effects other bodies might have on altering orbits in a negative way etc. The magnetic field is very important. It may be useful at a range of values from maybe 1 tenth to triple what we have on Earth just to make some numbers up. We could check through calculation and get a rough idea of an actual min/max value, and then consider what amounts of what elements in the core can maintain a planet in that sort of ratio and will still allow liquid water and an atmosphere that is not crushing thick or vanishing thin. It will help if the atmosphere is majority not very reactive. If we then get some values of numbers possible scenarios we can say that within every 100 planets of earth size we will have 2 or 3 that may not be lethal to life just to make some more numbers up. So even if the emergence of life is common, its persistence may be rare. Emergence of life is not common at all. It's absolutely IMPOSSIBLE for life to spring up all by itself from purely materialistic physical and chemical processes alone. This is relatively quite easy to show mathematically - as has already been done by Fred Hoyle and Wickramasinghe. This led to Chandra's firm belief in panspermia. Life could not have arisen on earth all by itself from purely physical and chemical processes. SOMEONE needed to have created or planted life here. Hence one can seriously challenge the statement above - how do they know that that SOMEONE has planted life anywhere else????? And once we have calculated possible scenarios of habitable planets then we come to why should life evolve anything more adventurous than a bacterium or for that matter anything more evolved than a virus - or even a prion. prion, virus, bacteria, Achaea etc. etc. etc. not necessarily in that order. might be million to one shot just to get amoeba. They could be right that most (including us) die young, how many years do you think we have left before we destroy ourself back to the stone age and become invisible again. When a man deny the fact that the willful emergence of life without direct intervention of powerfull intelligent being is impossible because of irreducible complexity, physical laws and laws of information, for him remains only the option to satisfy his pasions with endless useless speculation. It will be hard for the people who like darness to accept light. Whereas true origin and rarity of life including us is remain elusive (some possibility of panspermia or alien revelation), biological colonization/geoenginnering or contamination of nearby semi-habitables seems relatively easy. In future life derived from earth will explode in galactic neighbor everywhere. The idea for panspermia is put it mildly stupid and only demontsrate desparation. It does not solve the problem for the life emergence because if the life can willfully emerge somewhere in the universe, it could emerge on the Earth also. But this it is imposibe. If we cosider the theory of evolution as religion of lawlessness, we can accept such speculative idea. But from the point of view of science, such idea is unacceptable. There are organisms in the deep ocean near 700 degree hot water vents. Those purple tubes THRIVE there. That leaves open the possibility of life even on Venus! The truth will out! Emergence of life is not common at all. It's absolutely IMPOSSIBLE for life to spring up all by itself from purely materialistic physical and chemical processes alone. And how, pray tell, did that SOMEONE come to be? Magic? Nobody blinded by sin can see it. I find the negativity of the article toward the possibility of intelligent living "creatures" on exoplanets due to dynamic upheavals extremely unappealing. Particularly when advanced science instruments such as telescopes have only been in use for less that 100 years and those instruments have never delved far into those exoplanets to SEE optically whether or not life exists. Thus, the article offers ONLY speculation, and nothing of pure fact. There can be no certainty UNTIl the advanced telescopic instruments are able to detect anything on exoplanets down to the size of 1 meter in width. Another pathetic attempt to classify evolution as a religion, while making bold assertions without evidence. And please learn to spell. Evolution is merely the "byproduct" of what had been Created. Many who claim to be religious don't understand this concept - that nothing that has been created, whether spiritually or by a collective of molecules - can continue to exist without evolving and changing for its betterment. Until believers in a Creator understand this concept fully, they will fail to understand the connection. We probably going to cook Earth, proving that Gaian hypothesis is right, that life cause a runaway greenhouse. Or we could regulate the air, again proving the Gaian hypothesis. It's a Gaian "law" guys... the proof is right here, on Earth. I don't think life is all that unlikely, and I think we've seen that already; the chemicals that make up our kind of life seem to be pretty common in the galaxy, according to our observations. Also they seem to combine to form autocatalytic networks pretty readily, and that's very close to life as we understand it; our kind of life almost certainly emerged from such autocatalytic networks. Once life exists and differentiates due to environmental variation, competition becomes possible, and that leads to evolution of more complex life. Even so, it took about 3 billion years from the first life to sexual reproduction, and for that matter a billion just for photosynthesis to develop. And from there to life on land took another billion years. We are young. We need to be prepared to be patient.